My allosaurus at the Denver Museum of Nature and Science. 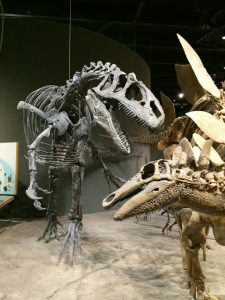 Read about The Dinosaur’s Daughter, my 1980s coming-of-age memoir as a bullheaded beer-swilling Colorado teenager, living alone with a dinosaur under my bed, her fossilized bones both a deep past and possible bright future. I am a naturalist and nonfiction writer growing in Boulder, Colorado. I am a past member of the Society of Vertebrate Paleontology and a current field research volunteer at the Denver Museum of Nature and Science. An at-large member of the Author’s Guild, I earned a degree in English literature from Dartmouth College and completed numerous creative writing workshops at the Denver Lighthouse Writers Workshop. In my former life as an MIT Sloan MBA I authored 15 national publications on creative industries, produced in collaboration with editors and designers and published by trade associations and media companies. I am an experienced public speaker after years as a trade show keynote and awards presenter. I currently manage foreign rights, licensing, and promotion for the Nancy Wood Literary Trust, which holds all rights to my mother’s 28 published books.